My dad sent me an email a few weeks ago with no message attached, just an article entitled "Billionaires Dumping Stocks, Economist Knows Why?" Knowing my dad, what he wanted to know was if he too should be joining the so-called "smart money" and dump his portfolio. Because we still feel the sting of the financial crisis, we're jumpy about making a move because we might get hurt again. Articles like the one he sent are enough to make anyone jumpy. If you dug into that article or any of the myriad like it that are out there, you'd find another expert who has found something big. In this case, according to the article, "Warren Buffett, who has been a cheerleader for U.S. stocks for quite some time, is dumping shares at an alarming rate." It noted that in the latest SEC filing for his company, Berkshire Hathaway, had slashed its holding of consumer product stocks by 21%. It went on to say that "Buffett's apparent lack of faith in these companies' future prospects is worrisome." That article went on from there to point out other billionaires who sold equally massive amounts of stock. The real kicker here is that these sales are tied to those billionaire investors' fears that a massive correction is about to hit the market. That correction, according to that aforementioned economist, could be as much as 90%. My fellow Fools, that'll catch the attention of any investor. The thing is, the article my dad emailed me was originally dated Feb 6. As luck would have it, not more than a week later Buffett announced a deal signaling that he was in fact not dumping the American consumer. Instead he was doubling down on that bet by teaming up to buy Heinz for more than $23 billion. Ah, the value of hindsight in making a decision. Buffett's reason for trimming his consumer-facing stocks could have more to do with opening room in his portfolio for Heinz than about any correction fears. It would also appear that Buffett is taking a page out of his own book and being greedy when others are still fearful. My advice to my dad is to just buy great companies and don't worry about what the market is doing in the short term. We'll never know when that next correction is coming so only luck would save us from that pain. Instead, by investing money for the long term we can profit alongside great businesses. That's why I'm encouraging him to join in on what Buffett's really doing and buy a few shares of a great company and not worry about trying to time the market. Here's a sneak peak of the list of three companies I think he should consider buying now. 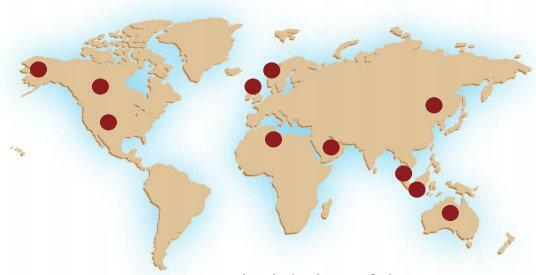 As the largest independent oil and gas company, ConocoPhillips is a solid energy choice for any investor. It's going to grow its oil and gas production by 3%-5% annually over the next few years. That's pretty good growth for such a large company. Even after reinvesting billions to meet those production growth goals the company will have plenty of money left over to pay its investors a very healthy dividend, which currently yields almost 4.5%. With worldwide operations, as you can see in the image below, this is one of the better pure-play investments on the growth of energy demand. My dad already owns a few shares of this energy giant but I see no reason why he shouldn't be adding more. 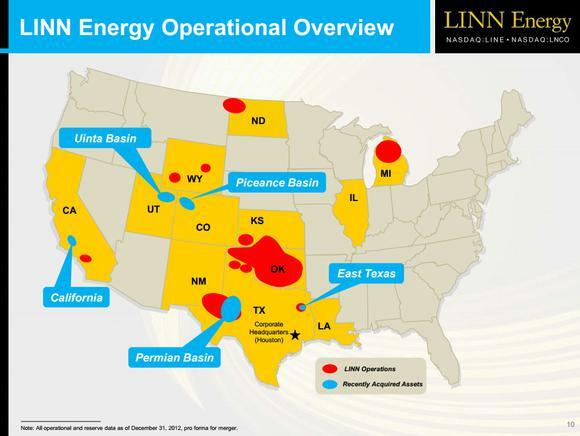 LinnCo is a bit unique as its sole purpose is to own units of LINN Energy . Because LINN is structured like an MLP it causes a bit of a tax headache for some investors so the company created LinnCo to appeal to a broader investor base. My dad also owns shares of LinnCo, and like Conoco he owns this one for its generous dividend. At last count that dividend was just over 7%; however, the company already announced it was going to grow that dividend by another 8.5% later this year. As you can see below, 100% of the company's production is based in the U.S.
With 100% of that production hedged for the next few years, the company's very secure dividend will continue to flow for years to come. It's a great income stock for those investors who want to buy into domestically produced oil and gas. Sticking with the energy theme, but adding a bit of diversity, National Oilwell Varco is the energy industry's top equipment provider. Known as "No Other Vendor" because of the broad array of products it provides, the company isn't as dependent on energy prices to profit. The only downfall, if you can call it that, is that the company's dividend is less than 1%. However, because of its massive market share it's among your safest bets to invest in the growth of worldwide energy production. Even though we're hitting new highs on the market, that doesn't mean it's time to sell. In fact, I think all three names on this list will reward investors in the years ahead. Sure, the market could pull back, but trying to time a pullback is a real fool's errand. National Oilwell Varco is perhaps the safest investment in the energy sector due to its industry-dominating market share. This company is poised to profit in a big way; its customers are both increasing the number of new drilling rigs and updating aging fleets of offshore rigs. To help determine if it could be a good fit for your portfolio, you're invited to check out The Motley Fool's premium research report featuring in-depth analysis on whether NOV is a buy today. For instant access to this valuable investor's resource, simply click here now to claim your copy. The article 3 Stocks You Can Buy Even as the Market Hits a New High originally appeared on Fool.com. Fool contributor Matt DiLallo owns shares of ConocoPhillips, LINN Energy, and LinnCo. Matt DiLallo has the following options: Long Jan 2014 $70 Calls on Berkshire Hathaway and Short Jun 2013 $92.5 Calls on Berkshire Hathaway. The Motley Fool recommends Berkshire Hathaway and National Oilwell Varco. The Motley Fool owns shares of Berkshire Hathaway and National Oilwell Varco. Try any of our Foolish newsletter services free for 30 days. We Fools may not all hold the same opinions, but we all believe that considering a diverse range of insights makes us better investors. The Motley Fool has a disclosure policy.